^ Staff (August 10, 2015). 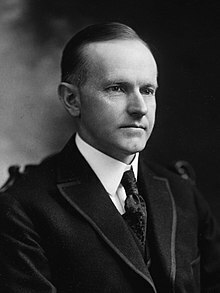 "The Peculiar and Biting Calvin Coolidge Wit". New England Historical Society. Retrieved January 30, 2019. 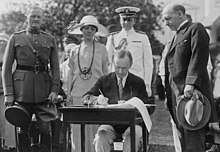 ^ "Calvin Coolidge: Foreign Affairs | Miller Center". Miller Center. October 4, 2016. Retrieved October 28, 2018. ^ "Dawes Plan | World War I reparations". Encyclopedia Britannica. Retrieved October 28, 2018. ^ Marriott, Leo. (2005). Treaty cruisers : the world's first international warship building competition. Barnsley: Pen & Sword Maritime. p. 12. ISBN 1844151883. OCLC 60668374. ^ a b c "Foreign Policy". coolidgefoundation.org. Retrieved October 28, 2018. ^ "The Great Lakes-St. Lawrence Seaway System". Saint Lawrence Seaway. March 20, 2014. Retrieved October 28, 2018. ^ Mashon, Mike (November 3, 2016). 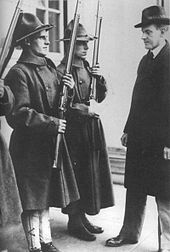 "Silent Cal, Not So Silent | Now See Hear!". blogs.loc.gov. Retrieved February 9, 2019. ^ Staff (May 23, 1927). "Medal of Honor will be awarded to Lindbergh". UPI. Retrieved February 9, 2019. ^ Unknown (1927). 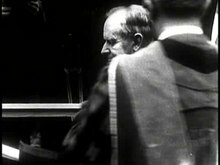 "Lindbergh honored by President Calvin Coolidge". Periscope Film. Retrieved February 9, 2019. Associated Press (February 2, 1932). 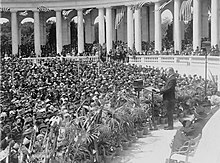 "Confirms Daugherty's Story of Coolidge's Second Oath". St. Louis Post-Dispatch. St. Louis, Missouri. p. 1C. Retrieved May 31, 2018. Kappler, Charles (1929). "Indian affairs: laws and treaties Vol. IV, Treaties". Government Printing Office. Archived from the original on October 11, 2008. Retrieved October 14, 2008. Landry, Alysa (July 26, 2016). "First Sitting Prez Adopted by Tribe Starts Desecration of Mount Rushmore - IndianCountryToday.com". IndianCountryToday.com. Retrieved June 11, 2018. Martin, Douglas (June 4, 2000). 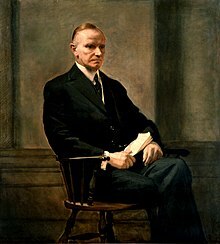 "John Coolidge, Guardian of President's Legacy. Dies at 93". The New York Times. ISSN 0362-4331. Retrieved May 31, 2018. Roberts, Jason (2014). 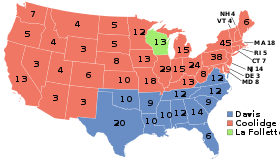 "The Biographical Legacy of Calvin Coolidge and the 1924 Presidential Election". In Katherine A. S. Sibley (ed.). 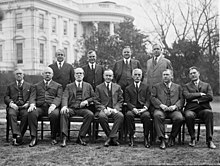 A Companion to Warren G. Harding, Calvin Coolidge, and Herbert Hoover. Wiley Blackwell. ISBN 978-1-118-83447-3. Senate Historian (2014). 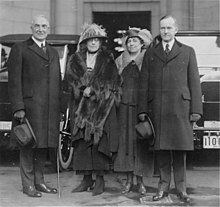 "Charles G. Dawes, 30th Vice President (1925–1929)". US Senate. Archived from the original on November 6, 2014. Retrieved February 2, 2017. Coolidge, Calvin (1964). Howard H. Quint and Robert H. Ferrell (ed.). 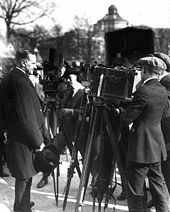 The Talkative President: The Off-the Record Press Conferences of Calvin Coolidge. University of Massachusetts Press. Coolidge, Grace (1992). 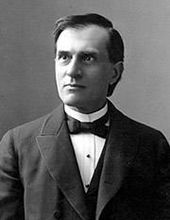 Wikander, Lawrence E.; Ferrell, Robert H. (eds.). 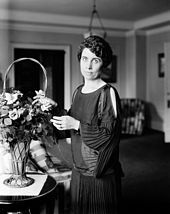 Grace Coolidge: An Autobiography. High Plains Pub. Co. ISBN 978-1881019015. LCCN 92072825.